Film directors sometimes play a trick on the audience: you seem to be watching the ending of the movie with credit titles appearing, those that only a few read. So, those who will watch them till the end will be rewarded: the continuation of the movie and the real upshot awaits them! The upshot that actually explains the whole film. What's the connection? My hasty conclusion that the World Cup could be divided into three stages certainly needs correction. The tournament was marked with the fourth, the most dramatic series of events - it started in the third classical game when Svidler lost his nerves. This was the start point of something that made the tournament in Baku not just another event to remember time after time, but an outstanding competition. It was a grand final, which, according to Kirsan Ilyumzhinov, will be impossible to replicate in the nearest hundred years (although I would disagree with him since I don't think the chances to repeat something similar are miserable. 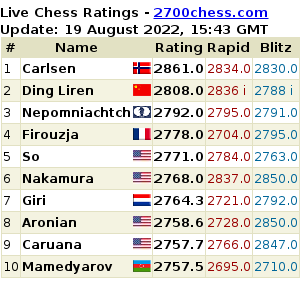 It seems like classical chess will extinct soon, whilst in rapid - literally anything is possible). Those who were following the events won't forget it, but those having seen it live will NEVER forget it. It is that rare occasion when history will remember not only the winner's name but also the person who finished second. Can you recall, and especially without googling, whom Kamsky defeated in 2007 final? Or who was Gelfand's victim in 2009? And in this case, once Karjakin and the World Cup 2015 will be recalled some dozen years later, it will mean that very final with Svidler. They are inseparable now, our heroes - Karjakin and Svidler. Sergey's feat is worth of a special mention and comprehension, which we will provide later. Now see through the eyes of your correspondent how the events unfolded. There was a suggestion from an unnamed source: Karjakin is soon to become a father, so if he has a boy, he might call him Peter. I would suggest to go even further and give him the patronymic Veniaminovich. Aren't they inseparable, our heroes? And if he has a girl, there's another suggestion to call her a very chess name - Petra. No need in the patronymic. On 1st May in the Sochi hotel Zhemchuzhina [Pearl - Ed] the national club championships started, the biggest mass chess event in Russia. In the annually-changing club line-ups, this year we have not just stars, but superstars. Our photo correspondent Mikhail Sholudko decided to join with the proletariat of all countries and this is what happened. On the free day of the Shamkir tournament there is traditionally a football match. As last year, four teams were playing. In the semifinals, the chessplayers of Azerbaijan and the rest of the world, alas, lost to the teams of journalists and organisers/sponsors. But Magnus Carlsen played in the final as a guest for the organisers/sponsors' team, strengthening an already strong team. He was the outstanding player on the pitch. An unusual situation: two world team championships starting on the same day in different corners of the world. The best women's teams are in China, and the best men's in Armenia. What distinguished the opening ceremonies of these two events? Which was shorter, which was prettier? Judge for yourselves, with the aid of photos we have taken from the official sites: chengdu2015.fide.com (author - Anastasia Karlovich) and tsaghkadzor2015.fide.com (author unknown). Anatoly Karpov's main place of work these days is an office at the State Duma, and nowadays people are as interested in his political opinions as in his views on chess. The match taking place in Riga against Evgeny Sveshnikov is one of few possibilities to see the twelfth world champion in the environment one has been used to seeing him in for decades. 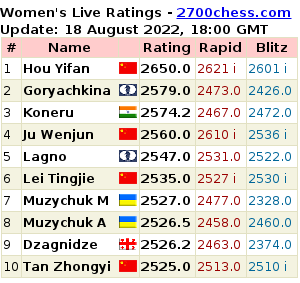 In Chavki, 98 players are competing for the European Women's Championship. The opening ceremony was covered by Sofiko Nikoladze. When I started to prepare this report, I saw the appalling news from Moscow. It destroyed my wish to describe the closing ceremony of the third Grand Prix stage. I hope the readers will excuse me for this. The pictures are expressive enough so that you will probably need no hints to get the impression of how the Tbilisi stage finished. Chairman of Appeal Сommittee at the Women's European Championship, Fiona Steil-Antoni, went for a walk around Chakvi yesterday evening. She was accompanied by the player most discussed at the tournament so far, Mihaela Sandu. The first day-off in Baku began from the train journey.